(a) Check that the ignition switch is off. (b) Check that the cable is disconnected from the negative (-) battery terminal. Wait at least 90 seconds after disconnecting the cable from the negative (-) battery terminal to disable the SRS system. (c) Insert the pin (stopper) into the body hole. 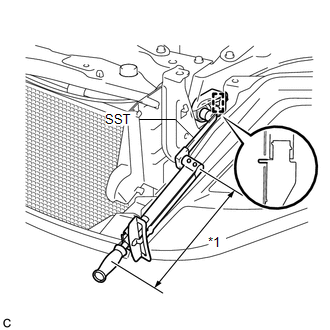 (d) Using SST, install the front airbag sensor with the bolt. This torque value is effective when SST is parallel to the torque wrench. If the front airbag sensor has been dropped, or there are any cracks, dents or other defects in the case or connector, replace it with a new one. When installing the front airbag sensor, be careful that the SRS wiring does not interfere with or is not pinched between other parts. Make sure that the pin (stopper) is securely inserted into the body hole. Tighten the bolt while holding the front airbag sensor because the front airbag sensor pin (stopper) is easily damaged. Calculate the torque wrench reading when changing the fulcrum length of the torque wrench (See page ). (e) Connect the connector to the front airbag sensor. When connecting the airbag connector, take care not to damage the airbag wire harness. 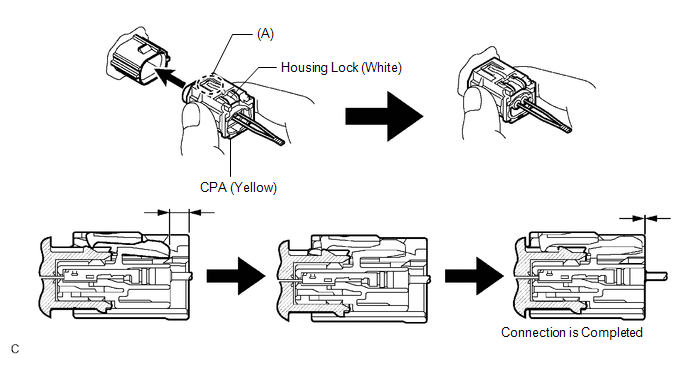 (1) Before connecting the connector, check that the position of the white housing lock is correct as shown in the illustration. (2) Be sure to engage the connectors until they are locked (When locking, make sure that a click sound can be heard). When engaged, the white housing lock will slide. Be sure not to hold the white housing lock and part (A), as it may result in an insecure fit. (f) Check that there is no looseness in the installation parts of the front airbag sensor. 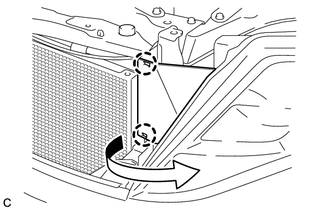 (g) Install the radiator side deflector LH with the 2 claws as shown in the illustration. (a) Perform a diagnostic system check (See page ). (a) Inspect the SRS warning light (See page ).